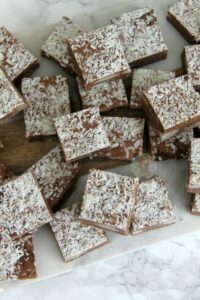 So I found some Bounty Bars in my never ending pile of delicious treats to bake with.. I have a habit of going to the supermarket and buying some chocolates and sweets for themed bakes, getting home and realising that I already had them, so I have multiples of everything. I found the Bounty Bars and knew I HAD to make something with them after the success of my No-Bake Bounty Cheesecake and oh my days the fudge happened. I was going to make some cupcakes, or even a cake, but I was craving something sweet and delicious that was SO easy to make, and would last for a while. I used a simple technique of the easy and (sort of) no-bake fudge and oh myyyyy. I based it on a similar recipe to my Speculoos/Biscoff Cookie Butter Fudge and Terry’s Chocolate Orange Fudge and it worked so much better than I thought it would! I was a bit nervous about using the Bounty Spread as its milk based, but using 400g of chocolate in the recipe helped firm it up perfectly. 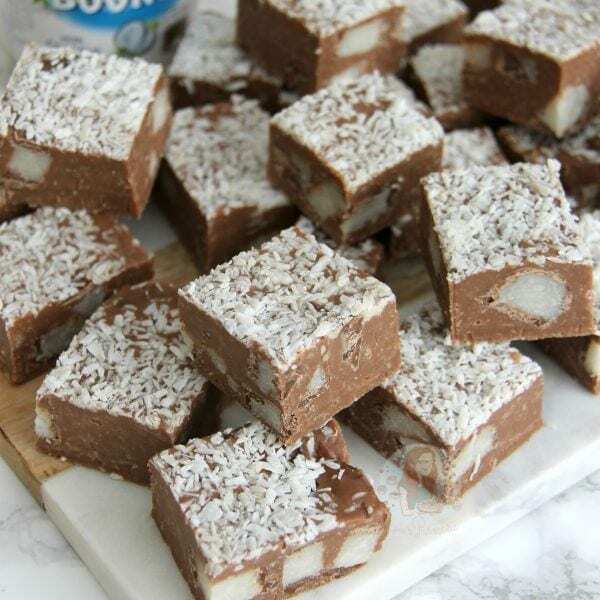 Having a Milk Chocolate based Fudge is delicious on it own, but adding the Bounty Spread to it makes it delicious coconutty and yum. 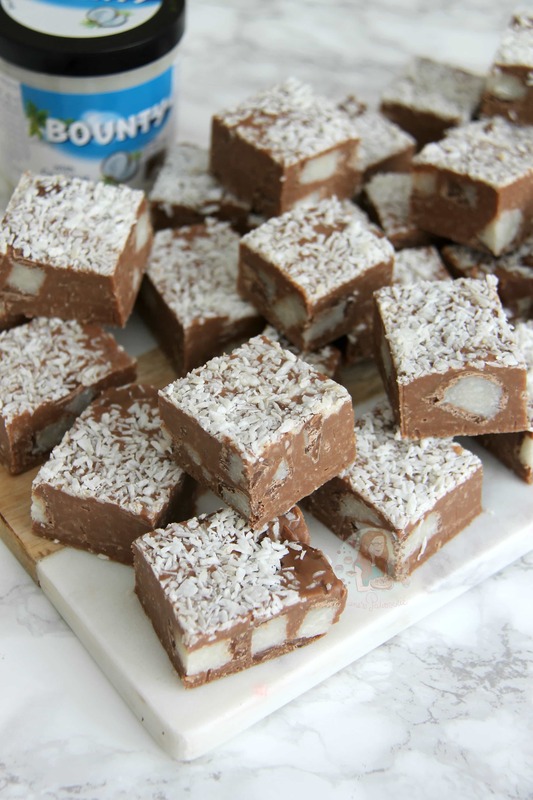 Adding chunks of Bounty bars makes it even better, along with some desiccated coconut on top was OH YES PLEASE. Some might say too much, which is why its optional, but I’m all about as much coconut as possible. I used to think I hated Bounty Bars when I was little, but in reality I think I just assumed I didn’t like them? Needless to say I was missing out the whole time. Make the neglected yet delicious treats in to fudge and oh my I wish I had started eating them sooner! I made a video for this delicious recipe as well so that you can see how its made… It is fairly self explanatory, but some like to see it so its easier! And I agree, sometimes you can read a recipe and you can’t work out how it gets from the recipe to the picture. 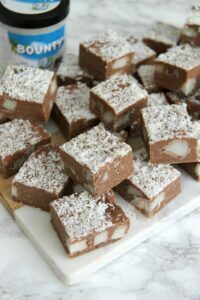 This video shows you how easy it is to get a DELICIOUS Coconut Chocolate Bounty Fudge out of very few ingredients and effort. Enjoy! Line a tin with parchment paper – I use a 9″ Square tray as it makes a nice depth of fudge! If you aren’t using the Bounty Bits inside the Fudge, reduce to a 8″ square tin! Put the chopped chocolate into a heavy based pan, along with all of the condensed milk, and bounty spread. Melt on a low heat, stiring often so that the chocolate doesn’t just get stuck on the bottom and burn and that all the ingredients mix together well. Once melted, tip in the icing sugar and combine well – it make take a bit of beating but a spatula and a bit of elbow grease will work a charm! Add in the Bounty Bars and fold though, pour into the tin and smooth over the mixture. 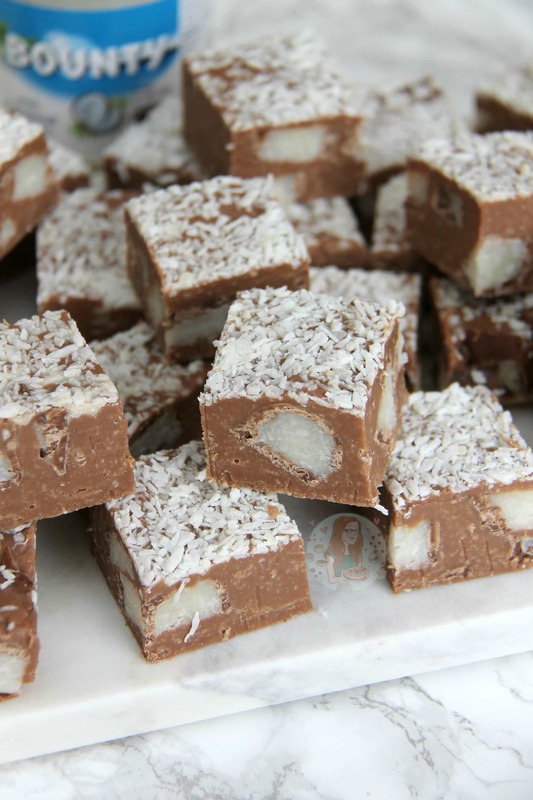 Sprinkle on some desiccated coconut and press down slightly so it sticks to the fudge. Store in the fridge for 5-6 hours to set, or overnight! 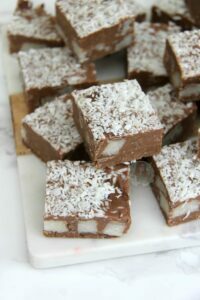 I quickly fold through the Bounty Bars into the fudge mixture because the chocolate coating of the honeycomb bars will start melting slightly, but the actual coconut part of the chocolate bar should be fine so no real need to worry about the mixture being too hot on this particular recipe. 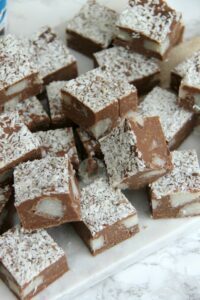 I press the Desiccated Coconut in to the top of the fudge with the palms of my hands so bits don’t fall off once its finished! I used a pack of 7x 57g bars of Bounty Bars for this as its what I had in my cupboard, but any will do! You could even use the Dark Bounty Bars or leave them out all together and just use the desiccated coconut! I found the Bounty Spread in Asda but its widely available in other supermarkets now too. You don’t have to use it if you can’t get hold of it though, the recipe will work the same without it! Older Next post: M&M Cookies! Love your recipes. Do you need to substitute something in place of the bounty spread if leaving it out? Either works fine! I just wouldn’t microwave all the ingredients.. so I either microwave the chocolate and add the two ingredients, or I melt them all together. Done and in the fridge to set! What a work out for my arms! ?